Last Winter I had no notion when I responded to Debbie Singiser’s email requesting volunteers for hosting international students the enormity of the gift we would be receiving. The gift was the very special friendship of three incredible Chinese international students, Rita, Rebecca and Tami. The girls have brought incredible joy and enrichment into our lives. Last night was our first time seeing the girls after their summer break, which they spent back at home in China. After dinner I sat back and watched the beautiful interactions in our home, and once again felt so thankful. 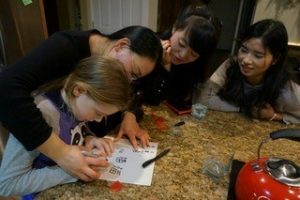 Sitting there at the dining room table amidst the food, music and candles I heard Mandarin being spoken, girls giggling, and our young daughters learning about Chinese art, history, calligraphy, and most importantly connecting as family with our sweet friends. We spent the next day exploring a Vermont farm, something I have taken for granted. I have to admit watching all of the girls petting chickens, milking cows, and riding on a tractor is so much more fun through the lens of someone who has never experienced it before! Initially last winter when I spoke with Debbie on the phone regarding hosting an international student she informed me that many of the international students would not be flying home for the holidays, and would be alone on campus. She informed me that many of them would love to experience an “American Christmas” and share a connection with a family. 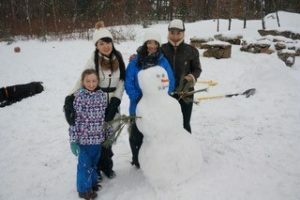 The prospect of having a student from another country to share our traditions and learn from theirs sounded like a fresh way for our family to celebrate, and appreciate the true meaning of Christmas. We told Debbie we were interested in hosting more than one student, and learned that there were three Chinese girls who were interested in staying together and spending time with a family. Our family suddenly became giddy about Christmas – What could we share with them? And experience together? Should we take them sledding? Or to see the Christmas lights?! Last Christmas with the three girls was just the beginning of this incredible gift of friendship to our family. We have since had many adventures with the girls. We have all been Nordic and alpine skiing, and sledding together. 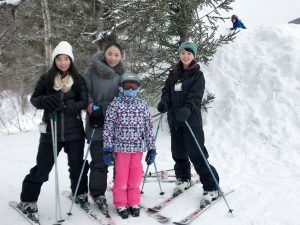 What a joy to watch our 9- year-old teach the girls how to ski! These adventures have all ended with a lot of giggling, hot cocoa, and a new appreciation for things we tend to take for granted. Our family spent an entire evening last fall learning to make Chinese dumplings, even our 5-year old was part of the dough rolling and vegetable stuffing. We love Chinese dumplings! We celebrated the Chinese New Year in authentic style, and learned a Chinese board game thanks to our sweet friends. We have learned some new traditions, and shared ours. We are thrilled to have another year with “our girls” now that they have returned to Castleton for the year. We would encourage other families to consider hosting a student or two. It has been a huge blessing to our family, and has carried the energy of adventure, connection, and curiosity into our home. We are excited for this next year, and for the experiences and adventures we will share!